Originally designed in 1945 by design duo Charles & Ray Eames, this classic, minimalist chair will instantly add a contemporary elegance to your dining room. This dining chair is also perfect for public canteens and schools. 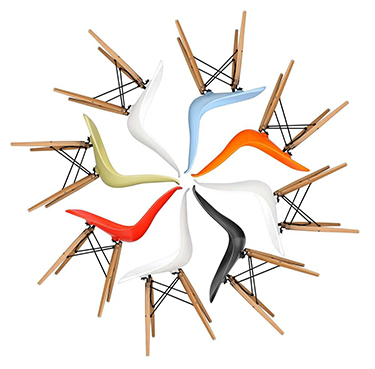 Available in a variety of colours & wood types, including oak and walnut. What begun as an experiment in their apartment in 1945 created Charles and Ray Eames' much loved and most sought-after dining chair. The chair was created by pressing thin sheets of wood together against a heated membrane that was powered by a bicycle pump. Truly innovative and expertly crafted, the DCM, which stands for Dining Chair with Metal legs, sits you comfortably thanks to its ergonomically impressive design.